decorating for fall doesn't need to cost a lot of money, and you can make some really darling decor with simple things you already have around the house. pull out your cake stand, and place a pumpkin on top. i am a huge fan on painting pumpkins white! i think it looks very chic. i think the reason i love both ideas in this post is because you aren't just setting out your pumpkins, you are showcasing them. the next idea i have is one i plan on implementing around my home, and it too can be done simply by using existing items from around your home. for example, many of us have candles around the home. simply remove your candles from the candle pillars, and replace it with a pumpkin. although i am dying to, i am making myself wait to put out my decor until october 1st. i will probably use the real mini pumpkins, but these were the only pumpkins not packed away in storage. I love the painted pumpkin. I remember that picture from a magazine and always liked it. 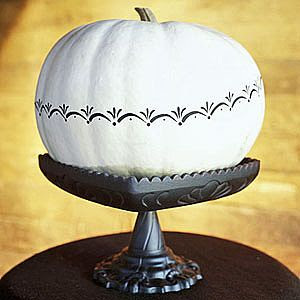 I just found a box of cute pumpkins at a yardsale yesterday and I'm planning on painting them in a similar style. Thanks for sharing your ideas! i am a 20-something stay at home mother that loves interior design. if there is one thing i love more than creating a darling piece of work, it is sharing my ideas with a girlfriend. feel free to send me your favorite design tips, and i will be sure to give you credit. this blog was designed to share home decor ideas, craft projects, gift ideas, and favorite family recipes. so email me at stacyleighrobbins (at) yahoo (dot) com if you have a secret worth sharing!